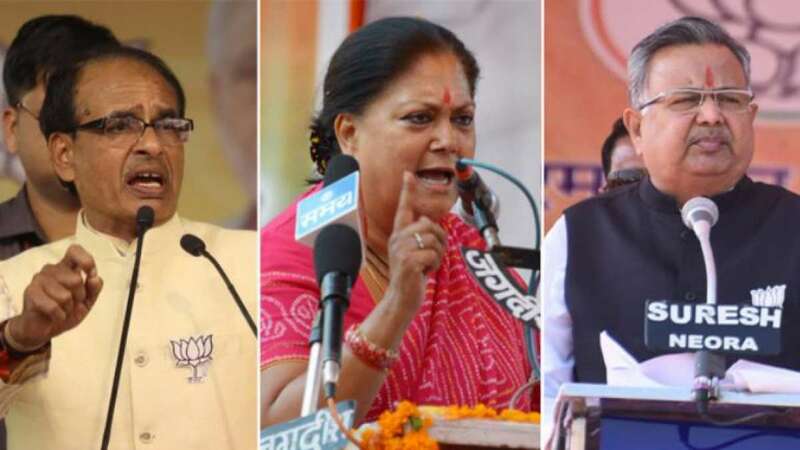 Rajasthan : The Congress took early significant leads in BJP-ruled Rajasthan and was locked in a close fight in BJP-ruled Madhya Pradesh and Chhattisgarh as officials counted the millions of votes polled in Assembly elections in five states. Election Commission officials also said on the basis of preliminary trends that the ruling Telangana Rashtra Samithi (TRS) was way ahead of the Congress in Telangana in the five-state elections seen as a trendsetter ahead of the Lok Sabha Polls next year. Congress and BJP candidates were leading in 18 constituencies each in Madhya Pradesh, which the Bharatiya Janata Party (BJP) has ruled for the past 15 years. In neighbouring Chhattisgarh, the two parties were forging ahead in nine seats each. Congress candidates were ahead of their rivals in 34 constituencies in Rajasthan, a state which has never re-elected a ruling party in recent times, leaving the BJP on the possible winning track in 25. The TRS made significant gains, leading in 28 seats, leaving the Congress way behind in 15 constituencies.